In Europe, the elderly are the majority group, an issue that implies specific attention. On many occasions, they need to be taken care of by other people. It is essential to talk about the gait, this plays an important role and it is necessary to maintain a joint width of movement adequate in the hip, knee and ankle so that the standing and walking are functional. Among the physical factors that limit mobility in the elderly are the articular and capsular, which can produce an immobility of the person and the appearance of pain, causing a significant deterioration in the quality of life of the elderly, a question that will give rise in most cases to the appearance of depressive symptoms. It is an obvious fact that public coverage must offer health activities to promote the health of this group. 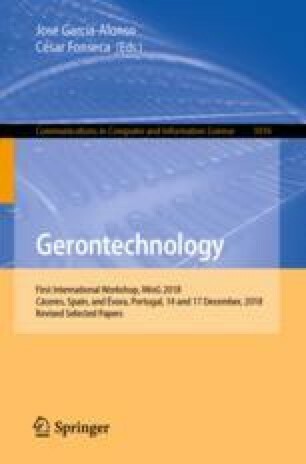 The purpose of this work is to document in a bibliographic and visual way a table of physical exercises and psychological techniques for its future implantation within the Primary Health Care (PHC) and the Machine Learning tools to develop a virtual gerontology nurse to assist in deploying the exercises at home. After an adequate automatic learning and health education, with greater implication of the nursing specialist in geriatrics and gerontology (GS) and once exercised, allow the elderly to develop with a maximum of autonomy and independence at home, as well as reduce the doses of drugs, an issue that will benefit health expenditure. We are proposing a Virtual Agent based in Computer Vision, Artificial Intelligence and Natural Interfaces that can perform unattended sessions for joint mobility improvement.